France is among the countries which boast a rich, long history as far as gambling is concerned. Some of the oldest gambling venues in Europe are located on French soil, not to mention this is the country to introduce the Queen to the standard 52-card deck we all have come to know and play with today. Many traditional table games were born in France, including staples the likes of blackjack and baccarat. It was in France that mathematician Blaise Pascal invented the roulette wheel in an attempt to create a perpetual motion machine. Yet, despite France’s colorful gambling profile, the country’s legal stance on online gambling remains rather paradoxical. Both landbased and some forms of online gambling are legal on the territory of the country, but heavy restrictions are imposed on the latter, preventing the French market from developing to its full potential. Despite the limited number of options Frenchmen are provided with, gambling remains a popular form of recreation in the county, with millions of French residents making bets online. Below, we offer French players an overview of the current gambling legislation in their homeland as well as brief information on the country’s regulatory authorities and taxation policies. The legal framework in regard to online gambling in France remained rather complicated for quite some time. All forms of interactive betting were considered illegal in the country until 2005, when the first steps towards regulation of the online gambling market were made. Once again, it was the European Commission that intervened and pressured France into opening its gambling market as was the case with several other European countries. After conducting an extensive investigation of France’s interactive gambling climate in 2006, the European Commission requested several amendments to be made to the existing legislation so that it becomes compliant with the European Union’s laws regarding free trade. Some of the conditions the Commission deemed “unfavorable” included the French gambling taxation system, the limited number of gambling options offered by the operators, and the rigid requirements for keeping gambling servers on the territory of the country. This pressure resulted in the French authorities introducing a new bill in 2009 that would at least partially open the country’s online gambling market to competition on behalf of operators, based in other member states of the European Union. The French Gambling Act is one of the most important pieces of legislation on gambling in France as it helped the country make its baby steps towards market liberalization. The Act officially came into effect as of May 12, 2010, and states that both landbased and online gambling is legal in France as long as the operators have acquired a license from a local regulatory body. On that note, it is also worth mentioning that the enforcement of the French Gambling Act coincided with the establishment of a new regulatory body, the Regulatory Authority for Online Games, that was to oversee and control the online gaming market in the country. Much to the demise of French casino game fans, the Act lifted the ban only on specific forms of online gambling. France may be the country where the roulette wheel originated from, yet players in this jurisdiction are not allowed to legally partake in roulette games over the internet. The same applies in full force to other games of chance, such as online slots, arcades, baccarat, and craps. Blackjack is also excluded from the list of legal online gambling options, despite the fact skilled gamblers can influence the outcome of the hands through advantage play. These casino games are available for real-money play only at brick-and-mortar gambling establishments in France. French legislators are primarily focused on preventing French players from becoming addicted to certain games that are based on chance. Lawmakers argue that playing the aforementioned games online comes with a higher risk of developing a pathological gambling problem since they were reliant solely on luck as opposed to games like poker, where players modify their strategy and are able to win thanks to their skills, experience, and knowledge. Thus, the Act allows operators that have acquired local licenses to offer only three forms of online gambling to French residents, namely poker (the Act states “club” games, but basically poker is the only table game permitted), sports betting, and horse-race betting. Some of the largest poker platforms in the world have already received licenses to legally operate in France, including big industry players PokerStars and partypoker. Then again, many online casino operators in the industry are not eligible to receive a French license by default because their portfolios consist predominantly of games of chance, which are deemed “addictive” by the French legislators. Online poker has been legal on the territory of the country for seven years now, but the operators need to pay hefty fees and taxes after obtaining their licenses from the French authorities. This is precisely what impedes the gambling market growth in the country. The license applicants are subjected to evaluation on behalf of the Regulatory Authority for Online Games (Autorité de régulation des jeux en ligne in French), simply abbreviated as ARJEL. You will be able to read more on the different gambling regulation authorities in France in the section below. Currently, there are several regulatory entities which are responsible for the supervision of gambling activities on the territory of France. Landbased betting is regulated and supervised by two different bodies, namely the Pari Mutuel Urbain (PMU) and the Pari Mutuel Hippodrome (PMH), which are responsible for overseeing the horse racing sector of the French market. Then again, the national lottery and other similar games of chance, such as bingo, are under the control of the Francaise des Jeux (FDJ). As was mentioned above, the Regulatory Authority for Online Games is the body, responsible for the licensing and regulation of all permitted forms of online gambling in France. ARJEL can issue interactive gambling operators three different types of licenses – for online sports betting services (which include pool betting, betting on the live markets, and fixed-odds betting), for web-based horse racing betting services, and for online poker products (which covers poker variations such as Omaha Poker 4 and Texas Hold’em Limit/No Limit/Pot Limit). The listed variations of poker can be offered by licensed operators in the form of cash games or tournaments. The Regulatory Authority for Online Games also ensures the locally licensed gambling providers operate in compliance with its guidelines. Other responsibilities of ARJEL include protection of vulnerable players, prevention of pathological gambling, ensuring fair play on behalf of online gambling operators, dealing with unauthorized gambling websites, and prevention of financial frauds and money laundering practices. France made the first steps toward market restrictions when in June 2010, the Regulatory Authority reached out to unauthorized gambling websites that were known to accept players from the country and politely demanded them to cease these practices if they do not intend to apply for a local license. Since these offshore operators were practically licensed under jurisdictions where online casino games were legal, French authorities had no way of effectively persecuting them. Because of this, the authorities opted for restricting the access to such unlicensed websites, rather than levying fines on them. The former is obviously deemed the more effective option. Once operators obtain a French license, they are subjected to system verifications and various compliance audits on a regular basis. 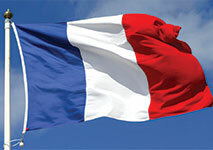 The Regulatory Authority has published an official list of authorized gambling operators on its website for all French players to see and updates it on a regular basis. Another requirement is for the online gambling operators to offer their services via a French domain, ending in the .fr extension. Very few online gambling operators continue to accept French players and to cater to their needs. Some web-based casinos support French which allows players from the country to conveniently manage their accounts, process payments, and participate in promotional offers in their native language. Since France is a member state of the European Union, French players are typically able to deposit in their preferred currency, the EUR. However, since such operators are not licensed by ARJEL, they risk facing fines for offering their services to local players. The good news is that players, at least, are not subjected to any persecution on behalf of the local government for betting at unauthorized casino websites. France opening its market to foreign competitors results in a number of benefits for local players as the latter are provided with the option to choose from a wider range of licensed, secure gambling websites where they could legally bet on poker and sports. However, there is one major stumbling block to the market’s liberalization and it results from the excessive taxes, levied by the local government. Taxes are imposed on both poker and sports betting but the taxation system in France works a bit differently when compared to that in other countries. For instance, there is a 2% tax that is imposed on poker pots plus the rakes that online poker operators typically collect from each pot. This translates into French players being forced to pay around 7.5% in overall rake per pot as opposed to other countries where poker fans pay an average rake of 4% to 5% per pot. Meanwhile, there is a tax of 8.5% on all sports betting wagers. Licensed gambling operators offering sports betting, horse race betting, and poker services over the web to French citizens are also expected to contribute with various taxes. The procedures concerning the application are similar for all three services, but a separate license needs to be issued for each. Thus, approved licensees are required to pay a fee of €2,000, €8,000, or €10,000, for one, two or all three licenses, respectively. In addition, there are annual fees that amount to €20,000, €30,000 and €40,000, depending on the number of licenses the gambling operators hold. The licenses are not transferable and expire after a period of five years, at which point, they need to be renewed by submitting another renewal form with the Regulatory Authority for Online Games. France may have commenced treading the thorny path toward market liberalization but unfortunately, its market is not growing at a rapid pace. This can easily be attributed to the fact the number of options players from France are given is quite limited, with poker, sports and horse-race betting being pretty much the only legal forms of online gambling in the country. The excessive corporate taxes and license fees are yet another obstacle to the market’s development as they prevent a good number of established online operators from even applying for a local license. Some large poker operators, such as Titan Poker, PKR Poker, and 888poker, have already opted for leaving the market altogether, citing the burdensome taxes as the reason. Many French poker players still prefer to engage in their favorite game of skill at unauthorized poker websites which have not obtained local licenses. This can be easily explained by the disadvantageous conditions French poker fans are forced to play in. Unfortunately, the increased rakes per pot are not the only disadvantage players from France suffer from. In addition, French poker fans, registered at leading poker platforms like PokerStars, are “fenced off” from fellow players from other countries since the French regulations dictate that only permanent residents of France can contribute to the accumulation of the online poker pools. Thus, when a given player accesses a licensed poker website via its .fr domain, they are able to compete only against other people who are located on French soil. As of February 2017, Winamax became the only online poker platform in France to accept registrations from people residing in other countries. This way, French poker websites cannot generate enough interest on behalf of local players as the latter simply have no incentive to bet there because of the smaller pools. In addition, this also leads to liquidity problems for the interactive poker operators themselves due to the limited player base frequenting their websites. The online gambling market in France has a huge potential to grow provided that various amendments are made to the current legislation, including the reduction of license fees and lifting the restrictions on online poker pools.